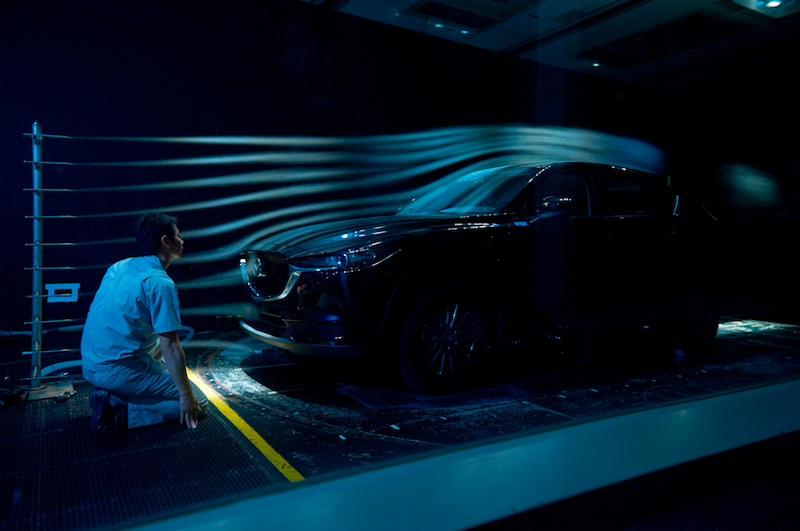 Hurricane-force winds, desert heat and blasts of microwave energy are just a few of the intense tests Mazda cars go through to get them ready for the road. 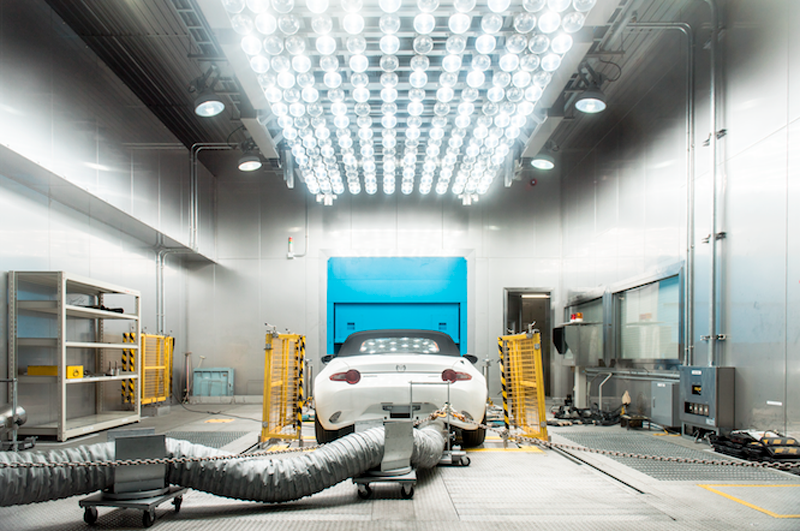 We take a rare look inside the vast chambers where the quest for driveability and reliability takes place. Takuya Fajita, engineer working at the Thermal & Fluid Function Development Group, Vehicle Testing & Research Department. Mazda made great strides in the refinement of the Mazda CX-5. And much of that comes down to time spent in the wind tunnel. Here, in the path of a 230km/h (143 mph) blast of air, the car’s aerodynamics were fine-tuned to improve high-speed stability, while increased insulation and improved window and door seals were developed to reduce wind noise and improve fuel efficiency by reducing air resistance. Since 1983, when Mazda built the aerodynamic testing facility at its Miyoshi proving ground, just north of Hiroshima, every production model has passed through its doors. Typically, the aero testing program lasts two years from first concept to finished model. This test chamber’s fan is eight metres in diameter, spins at 223 rpm, and its first subject, back in 1983, was the Mazda 323. Sho Shimamoto, engineer working at the Drivability & Environmental Performance Development Group. At the flick of a switch the sun appears. Row upon row of huge halogen bulbs turn night into day with a Death Valley intensity of light and an accompanying barrage of heat. In a matter of minutes, the temperature will reach 55°C (130°F) and an array of endurance tests will begin on this Mazda MX-5. During development, all new Mazdas spend up to 30 days in here, tested for performance and emissions in the most extreme conditions. Cars are driven at speeds of up to 160km/h (100 mph) on the rolling road or simply left under the lamps to examine the effects of heat soak. A matching chamber sits on the other side of the control room; this one a giant refrigerator that chills to -40°C (-40°F) ensuring that all temperature extremes are covered. This is one of Mazda’s newer chambers (having opened in 2016) and, with a lighting power of 880kW, it is one of the brightest. The first car tested in here was the MX-5 ND. Yasushi Hamada, staff manager leading the Electro-magnetic field test, and Electric CAE technology at the Integrated Control System Development Division. With Wi-Fi, cellphones, GPS, digital radio, and television all competing for space, our airwaves are a constant buzz of broadcasts on an increasing number of frequencies and wavelengths. Modern cars are packed with electronic systems—typically up to 100 computers—that need to be protected from potential malfunctions. That’s where this striking anechoic chamber comes into play. Inside the huge space, insulated with carbon tubes and polystyrene, and sealed off from the outside world, Mazda engineers bombard vehicles with radio waves—powered by a transmitter that’s more powerful than a national radio station. 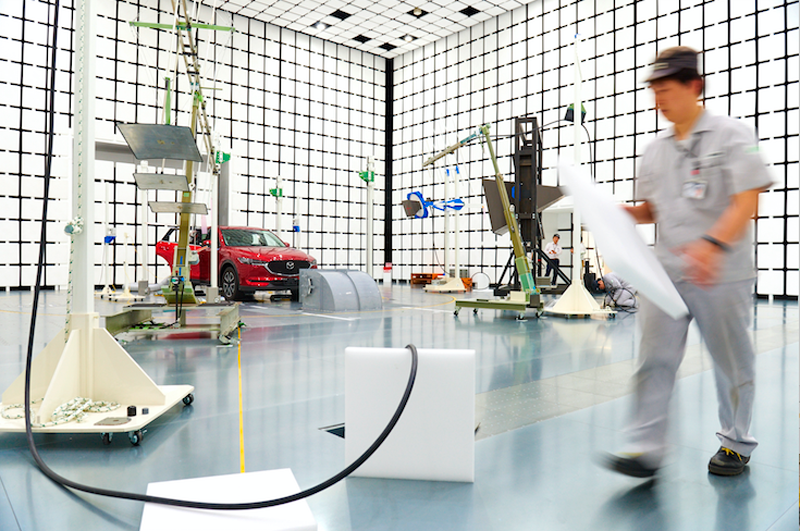 After testing here, all Mazdas are guaranteed to be totally safe from harmful electromagnetic waves, anywhere in the world. Much like the climate testing laboratory, this chamber opened in 2016; but unlike its colleague, the anechoic’s first subject was a CX-5.